On the application of photography to the representation of microscopic objects. Journal : Quarterly journal of microscopical science ; n.s., vol. i.
London : Samuel Highley, 1853. Description : 57-58 p., [1 l.] pl., [1 l.] legend ; ill.: 2 phot. ; 21.8 cm. Photographs : albumenized leaf with a composite of two images. Plate VII of the journal. Photographers : Joseph Delves and [Nicolaas] Henneman (1813-1898). Author caption: By Joseph Delves, Esq. Communicated by Mr. Bowerbank. (Read Oct. 27, 1852). Prepared for the Microscopical Society of London, convened October 26, 1852. Offprint : Transactions of the Microscopical Society of London. London: Highley (n.s., vol. i). The Transactions were bound with the Quarterly, but also issued separately. Cited: Shadbolt, On the photographic delineation of microscopic objects by artificial illumination. Ibid., pp. 165-170. Cited: Highley, On the practical application of photography..etc. Ibid., pp. 178-194. Harry Ransom Center owns the Delves, Shadbolt and Highley papers, bound together and titled, Communications on photomicrography. Photo caption top: Trans. Micro. Soc. Photo caption bottom: J. Delves, Negative. Henneman Imp., Positive. Photo captions are inscribed in the negative. The recent discoveries in photography render its application to the microscope a subject for much consideration, since only by its assistance can we hope to obtain trustworthy impressions of objects so delicate and minute. I would, therefore, beg to submit to the consideration of the Society the method I have adopted for producing these copies; and as an illustration of the successful application of Photography to the microscope, I have the honour of presenting the specimens which I have recently obtained. I must, however, beg to state that others have an earlier claim than myself to this application; but with so little success had it previously been carried out, that I believe I am correct in saying it has been generally abandoned as a means of depicting microscopic objects. But for the satisfactory result it is only necessary to refer to plate VII.—Delves, Page 57. The application of Photography to the purpose of delineating microscopic forms I have for some years entertained as a favourite project; but some practical difficulties of manipulation deterred me from putting it to the test until quite recently, when a sufficient stimulus was applied in the beautiful specimens both on paper and glass exhibited in the month of October last, at the Microscopical Society of London, by Mr. Joseph Delves, of Tonbridge Wells. Of the excellent promise for a highly valuable adjunct to microscopic science, the proofs in the present Number of the Journal will afford your readers an opportunity of judging.—George Shadbolt, Page 165 (v. supra). Convinced of the value of this beautiful art, the offspring of physical and chemical science, it is with a considerable degree of gratification that, as one of the Publishers of the Microscopic Journal, I am enabled to lay before the world in the plate which accompanies Mr. Delves' paper its first practical application as a printing process to the illustration of scientific literature, a field where it will be mostly appreciated. And it is to the principles involved, and the processes and apparatus employed, that I devote this paper, for the information of those of our readers who may be unacquainted with the details of Photography.—Samuel Highley, Page 179 (v. supra). These Positive Photographs from Collodion Negatives, taken by J. Delves, Esq., illustrate that gentleman's, Mr. Shadbolt's, and Mr. S. Highley's papers on Photography. 1. Spiracle and Tracheæ of the Silkworm, magnified 60 diameters, exhibiting the elastic spiral fibre between the layers of the air vessels. 2. Proboscis of the Fly, magnified 180 diameters, showing the divided absorbent tubes. Notwithstanding the entomological theme of the two images illustrating this paper – one is the magnified proboscis of a housefly and the other a picture of the spiracle and tracheæ of a silkworm – their significance for medical science was impossible to miss. They were the very first photomicrographs illustrating a text disseminated by a commercial publisher and they were the first of the first to demonstrate the brilliant definition made possible by Frederick Scott Archer's collodion process introduced in 1851. Delves exploited the speed and sensitivity of Archer's unpatented wet collodion emulsion used with the longer focal length of a 24 inch camera obscura that he fabricated and attached to the eye-piece end of a microscope. 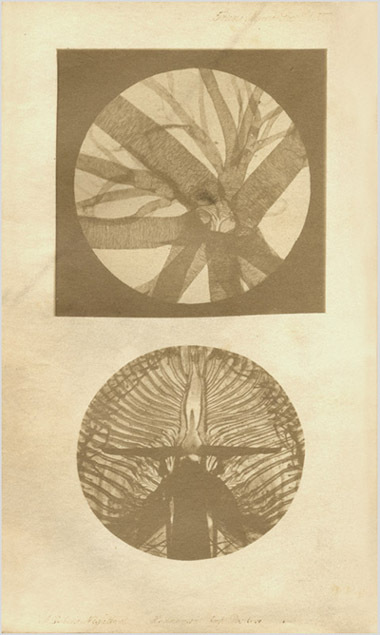 Alfred Donné had made an earlier attempt at publishing multiples of photomicrographs that he intended to use for an atlas accompanying his Cours microscopie titled, Atlas exécuté d'après nature au microscope-daguerréotype (Paris: Baillière, 1845 »»). But while Donné had established proof of concept for photoengraving, the silver substrate of his daguerreotype printing plates failed after only a few images were struck and he required the skills of the engraver Oudet to copy the images by hand. The idea of using daguerreotypes for reproduction photography died with Donné. Talbot originated the technique of photomicrography in 1839 by using a camera adapted to a solar microscope and he gave away 8 inch square prints to friends and colleagues in the scientific community including Sir John Herschel, but scientists were discouraged from experimenting in calotype photomicrography because of the patents that the litigious Talbot had placed on his process. They were also discouraged by the poor definition produced by the calotype process and by the year 1852 many scientists had given up on the idea of using photomicrography for illuminating their research. The astronomer and photomicroscopist Richard Hodgson (1804-1872) expressed this frustration in a paper he read to the Microscopical Society on November 24, 1852 titled, On the Reproduction and Delineation of Microscopic Forms in which he cited the failures of Donné, Claudet, Kingsley and others as evidence that photography could never serve the microscopist. Hodgson was probably ignorant of the sensation caused by Delves's presentation at the previous October 27th meeting of the Society, and his views were roundly challenged by Highley, Shadbolt, Delarue and others who presented him with examples of photomicrographs made by Delves. Delarue put forward the motion that Delves be recommended for a medal awarded by the Society of Arts for his achievment. If today the acclamation bestowed on Delves by members of the Microscopical Society sounds a little hyperbolic, it must be remembered that it came at a time of rising furor over the yoke of the Talbot patents, concommitant with the exciting and new prospect of toll-free enterprise bannered by Archer. The inaugural volume of the Quarterly journal of microscopical science held two other papers on photomicrography in addition to the Delves, one written by George Shadbolt (1819-1901) whose professional roles included editor of a photography journal (Liverpool and Manchester Photographic Journal), founder of the Photographic Society of London, and past president of the London Microscopic Society. With John Benjamin Dancer (1812-1877) he shared claim to the invention of pinhead or microphotographs, but Shadbolt's hygroscopic formula of collodion and his expertise in lenses and optics led to his improvements of the technique. After Delves and Shadbolt, the third paper on photomicrography was contributed by Samuel Highley, Jr. (1825-1900) of the London publishing firm Samuel Highley and Son, a leading British publisher of medical and scientific texts and journals including the Quarterly. The Highley firm published the first monograph illustrated by clinical photographs (Diamond, v. intra: »»). It was through the younger Highley's love of instrument making that the publishing house expanded into scientific armamenta beginning with a line of popular student microscopes. Samuel Highley designed and sold magic lanterns, promoting their use through numerous writings, and his firm also carried materials and equipment for photomicrography. It was entirely in keeping with his character that Samuel Highley was inspired by the Joseph Delves camera and immediately set out to make improvements, devising a more compact version that he demonstrated at the October 27th meeting of the Microscopical Society and described in his paper for the Quarterly (v. supra, p. 182). The positives were printed by Nicolaas Henneman whose long association with William Henry Fox Talbot began as the inventor's personal valet at Lacock Abbey, later assisting Talbot in his early experiments with photography. In 1844, Talbot appointed Henneman the director of The Reading Establishment, the first commercial production studio. The facility relocated to London in 1847 and was taken over by Henneman and a partner the following year. Henneman adopted Archer's process and in 1853 enjoyed the greatest financial success of his career as a photographer.